Location: Cahersiveen, County Kerry, Ireland. 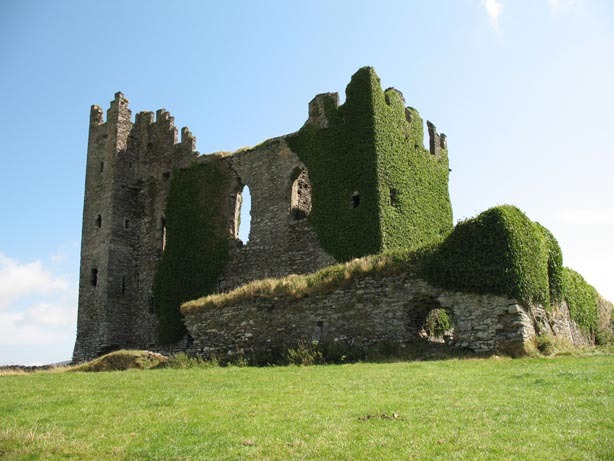 Notes: Ballycarbery Castle is a castle 3km from Cahersiveen, County Kerry, Ireland . The castle is situated high on a grass hill facing the sea and is a short distance from Cahergall Fort and Leacanabuile Fort. There was some kind of residence situated on the site of the castle as early as 1398 however the present ruins were constructed in the 16th century. It was noted as a McCarthy Mor castle by some sources at that time but whether it was occupied by the McCarthy Mors or their wardens the O'Connells is unknown. The castle was passed onto Sir Valentine Browne following the death of its owner Donal McCarthy More. In 1652 it was attacked by cannon fire from Parliament forces during the War of the Three Kingdoms. In the 18th century a house was built on the site using the barn wall and it was inhabited by the Lauder family. This house was demolished in the early 20th century.